After reading these definitions, no wonder we take it so personally! When you read the definition it not only define the word, but how we feel. Many single moms struggle with the pain of rejection after a severed marriage or relationship and can identify with the definition of rejection. I related to feeling worthless, discarded, useless, and unacknowledged when my realtionship ended and then again when we’d try to make it work. I carried that pain around for a long time, and if I’m not careful it can easily creep back into my thought process. Was I any of those emotions I was feeling? Absolutely not! But, the emotions derived from rejection are strictly from Satan. He receives pleasure when you view yourself as a failure, as worthless, and any other negative emotion he can squeeze out of rejection because it takes you further away from God and from seeing yourself as God sees you! The truth is rejection hurts, it makes you want to curl up and cry your eyes out, it isn’t easy knowing someone doesn’t accept you. But, God does and he’ll never reject or forsake you. When Jesus sent disciples out to preach the good word, he told them if a town or house doesn’t accept you then shake the dust off your feet and depart that city. Isn’t that great advice!! Don’t sit there pleading your case, trying to make them want you, or conforming to someone you’re not, shake the dust off your feet and keep moving! So much of our pain comes from trying to change the way a person feels about us. I don’t want to burst anyone’s bubble, but if someone doesn’t want to be part of your life, nothing you do can change that. We waste precious energy when we hold onto someone that doesn’t serve us and nor can we serve them. Jesus knew not everyone would accept the disciples, and he tried to prepare them for the rejection they’d surely face. He said bring your peace if they won’t accept it take it back. I think he meant don’t let the rejection you experience steal your peace take it back with you. When we succumb to the pain of rejection we lose our internal peace and become wrought with feelings of self doubt, sadness, and an unquenchable desire to become accepted or wanted. We allow rejection to rob us from a peaceful mind. If we’re going to move forward on the journey God has awaiting for us, we have to let go of rejection in all its forms, people, places and things. Rejection can be a door of opportunity, it is all in your perception. That fantastic job you didn’t get may be because God is preparing you for a better job. Instead of fighting it flow with it. We’re human so I’m not sure if we can help but to feel pain, but we can’t dwell or get stuck in it’s web. Pray for God to give you peace and take that peace with you when you make your departure. 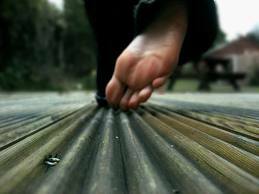 Shake the dust off your feet and keep moving forward. Remember this, you’ll be accepted and loved by many when you let go of those who’ve rejected you. You’re already accepted by God and there is no acceptance more worthy than his. Interesting post – I forgot about this verse. Always learning something when reading your post and God knows always when it is the good time for me to receive them. Rejection is a harsh feeling and thinking that one way or another we can change the people around us is something we believe in until we understand it is not the way. The way is to understand sometimes a realtionship does not serve us or other people need more time or are not ready to accept us the way we are. We have to move on, to pray and keep faith. Next PostNext I Received an Inspiration Award!